I’m down in Wellington for work again and this time I get to stay a night. So straight after work I went walking around the waterfront. While walking I observed all these cool people dressed up and possibly involved in some sort of treasure hunt. There were groups of rugby players, fairies, clowns, office workers and other strange but fascinating people. They were having loads of fun, really into the whole dress up thing not at all worried how they looked. That made me think of all the different sorts of people I saw heading home from their various offices on my way to the waterfront. The people in Wellington are different from Aucklanders… but in a good way – they’re all groovy. 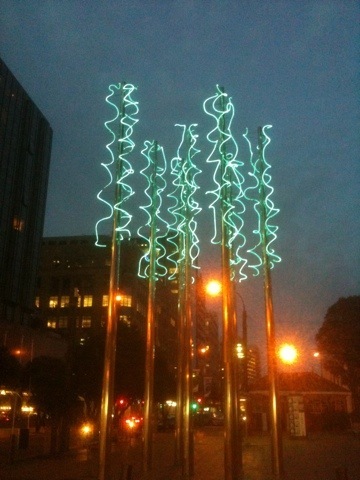 The photo is of a cool art thing near the hotel I’m staying in.